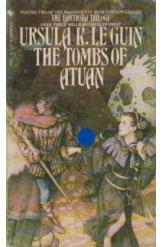 The Tombs of Atuan by Ursula Le Guin, Sci Fi. Book is in good condition, all pages intact. The wizard Ged comes to the Tombs of Atuan to recover the Ring of Erreth-Akbe. To do so, he must venture into the labyrinth of the malevolent Nameless Ones and lead Tenar, a woman who was given to the Nameless Ones as a child to be their unwilling priestess, back into the light. Book two of the Earthsea Trilogy.